This August has been one of the most beautiful monsoon seasons we can remember, with huge clouds rolling through all day every day, sun rays and rainbows, and scattered thunderstorms with curtains of rain all around. This past weekend we headed to Mesa Verde again! — this time for a bird’s eye view captured on video of our gorgeous skyscapes, and to tour the quieter west side of the park. We then backtracked to the east side to check out the new bbq smoker at Spruce Tree Terrace Restaurant. But really, this day trip was all about driving the winding roads on the mesa tops and taking in the spectacular views. The drive from downtown Durango was only 40 or so minutes. First stop, the Visitor’s Center to buy tickets for the ranger guided tour of Long House. Then a look at the exhibits and we always make a point to check out our route on the topographical map with buttons that light up the different roads and points of interest. 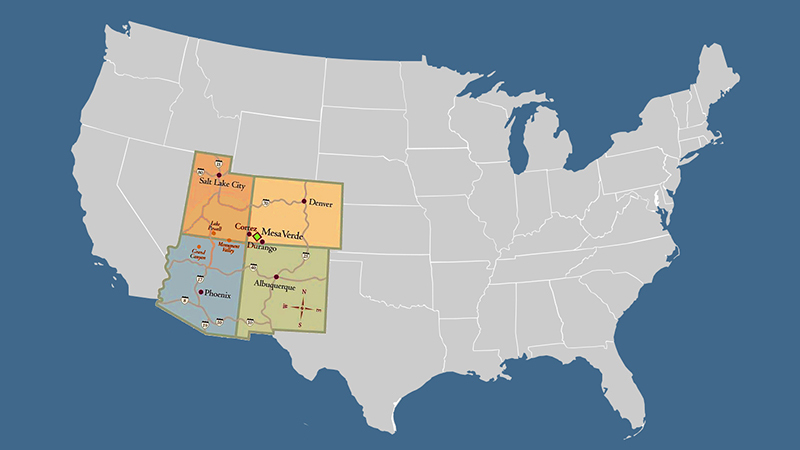 At the top (north) of this map is Highway 160 showing the route south from the visitor’s center to the center of the park where Far View Lodge is located, and then the western road to Wetherill Mesa, Long House, Step House, and other pueblo sites. Note how zig-zagged the roads are. Driving up the mesa and before you know it you’re high above the valley floor, taking hairpin turns and looking out onto Montezuma County that seems to go on forever. 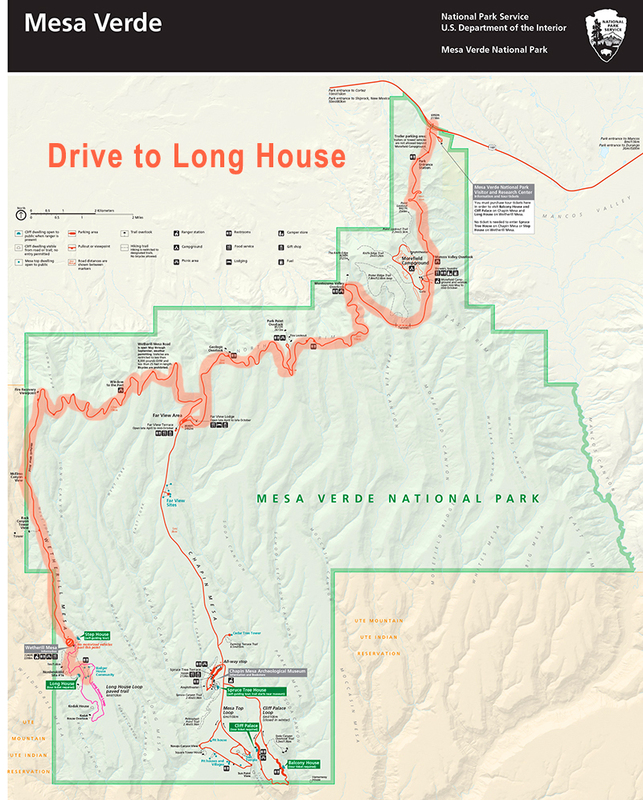 The drive from the Visitor’s Center to the Long House / Step House parking lot is about an hour (27 miles), depending on slower moving vehicles and stopping at lookout points for breathtaking views. On this day the air was clean and pure, with that unmistakable scent of fresh rain when every living thing in this arid high desert region sighs aaaaaahhhhh. We arrived an hour before our scheduled tour of Long House, leaving plenty of time to first explore nearby Step House. (Note: Step House closes at 4pm, and the last time to enter the dwellings is 3:30pm.) This is one of our favorite cliff dwellings, with a pit house, ruins to walk through, petroglyphs etched into the sandstone, the ancient outline of a hand print high atop the dwelling, and the ruins of a prehistoric staircase that once ran along the alcove wall. A self-guided tour, you can take your time and there’s a ranger on site for questions. 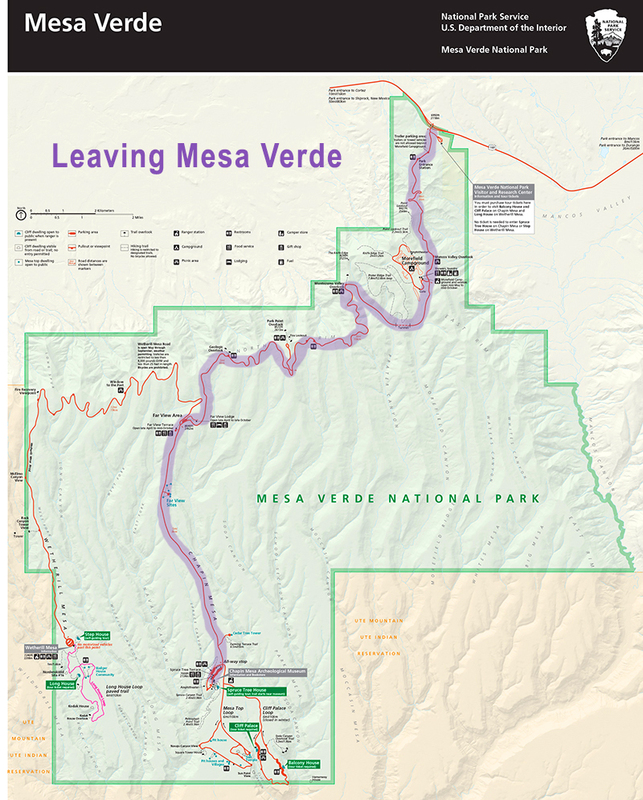 Note: the pathways are at times rugged and the walk back up to the mesa top can be strenuous. Wear sturdy shoes, a hat, and bring lots of water. Another gorgeous, relaxing drive with views, wild horses, scattered showers, and then lunch. The smoker is a 25K rig brought in from the mid-west and as you can see, the portion sizes are perfect (humongous) after hiking up and down pathways, through dwellings and climbing ladders. We ordered the ribs and brisket — tender, seasoned, deelish. Next time we’ll try the sausages and turkey leg. Afterwards, you are right next to the Chapin Museum that is full of artifacts, Spruce Treehouse can be viewed from above, Petroglyph hike trail head, and the picnic area overlooking a canyon is not far away. The drive back down the mesa was breathtaking. We always pinch ourselves that this amazing park is in our own back yard. If you have only one day to visit Mesa Verde, we suggest that you explore the busier east side, definitely tour Cliff Palace, Balcony House, drive the Mesa Top Loop Road and have a bbq lunch and then tour Chapin Museum. If at all possible, stay overnight at Far View Lodge and have dinner at the Metate Room. 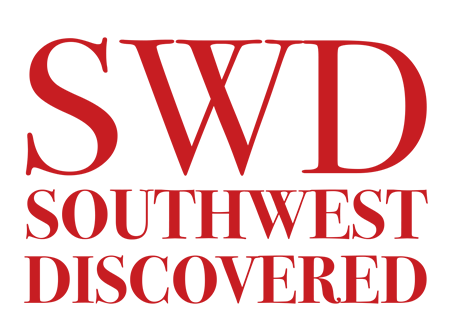 If you have two days, take that second day to venture over to the quieter west side for Long House, Step House, and the many sites in that area. Do you have a favorite Mesa Verde site or cliff dwelling? Leave your picks in the comments below, we’d love to hear about them! Wishing you happy summer discoveries! Your last video piqued my interest, so watching this was most satisfying — to see what sophisticated and massive structures they were capable of constructing in spite of primitive tools — I’m just amazed! Thank you! Ms. M, we were also marveling at the stonework, given the tools they had. It’s a gift to us all that we can walk through the structures and appreciate what the ancestral puebloans created. Now we see why things are named Far View at the park. 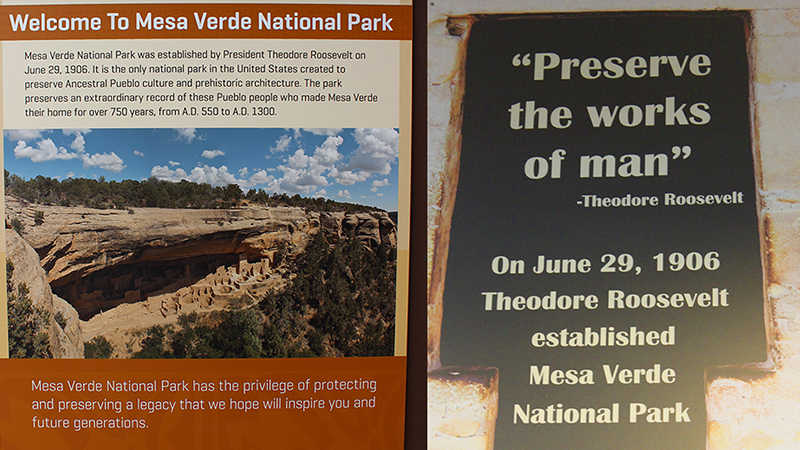 We are planning a Mesa Verde trip for this fall and will make a point to see the quieter side of the park. Thank you for the video. Marta, you will love touring the cliff dwellings and be sure to stop at all of the overlook points on your drive to Long House. Doc, thanks for taking the whole tour. Your comment is exactly why we do what we do, and share it. It means the world to us, thank you. Many thanks for the views and virtual tour, plus the winding drives through the park. More video tours please! Joanne, you got it. More videos coming. In fact, in the last few months we’ve tried to include video whenever possible, and we have plans for more all-video posts. Sammie, we are so glad you asked, because we asked them the same question. At the end of the day their chef and master bbq smoker takes a professional power washer that sprays down every bit of grease or tidbit that might attract bears. They also power wash the patio floors every night. Your video and maps make it clear to follow your route through the park, and the scenery images are great. Nice post. Al B., we are planning on more all-video tours, so stay tuned. And we are glad the maps are helpful, we’ll be sure to include them as often as possible. My favorite is Cliff Palace and my husband likes Balcony House because of the tunnel and climbing. We will definitely seek out Step House next time we’re on the west side. We have seen Long House and it is impressive. Thank you for the video tour! Barbara, when you go to Step House please send pics and we’ll share with everyone. It’s a smaller dwelling compared to Cliff Palace and Long House, but so special in that it has a pit house, pre-historic steps and lots of petroglyphs. You’ll love it! This was the most relaxing wonderful tour and the video makes me feel like I’m right there driving with you, looking out to the beautiful views and touring the cliff dwellings. Really nice video. I LOVED this one! Ally, your comment is exactly why we do what we do. More video tours to come, and we are so happy you’re along for the ride!